Our previous e-mail service wasn't reliable enough for the types of e-mail's we need to send. We've just updated our e-mail service to a new provider so you should see much better reliability. As always, please email support if you have any issues! Read more about Leagues are now FREE! The brand new app brings a mobile component to the TomorrowsPro offering. The app's primary function right now is to update your stats during a game in a quick and easy manner. Coaches will also have the ability to enter in the final game results. All stats updating works for coaches, players, and parents. See the TomorrowsPro's Official Mobile Page for screenshots and more details on the app features. Children are a huge part of TomorrowsPro. They are the reason most people create their accounts in the first place. We're debuting a new Child Management feature today that will simplify the way parents use TomorrowsPro for their children. Each parent can use their own account under their name and yet still have complete control of their child's account from theirs. Under "Personal Settings", navigate over to "Child Management". Add your child with first and last name so coaches can add them to teams if they want. Once you have your child added to your account, you can switch over to their account and back as needed. You will also receive any e-mail sent to them so you don't have to set up another e-mail address for them. As your children age and you think they are ready to manage their account on their own, there are also options to pass the account over to their e-mail address. 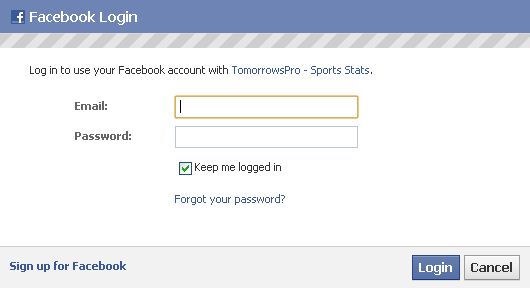 Start using this feature and setup your children on your account today! 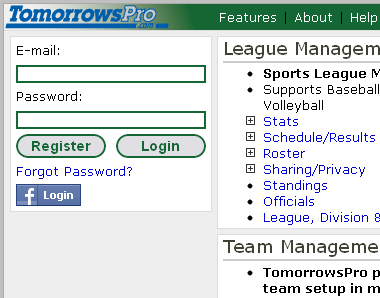 As you may have noticed, TomorrowsPro has received a well overdue face lift. Not only has this redesign improved the look and feel of the site, but it has also restructured the site to make it much easier to update in the future. This will allow us to build more features into the site in a shorter time period. On a side note...If you are using TomorrowsPro with Internet Explorer 6 or Internet Explorer 7, you may experience some issues. We strongly encourage you to download a new browser like Google Chrome. This is the browser that our developers use while developing so it's definitely our most supported browser. TomorrowsPro will load faster in Chrome than any other browser. If you don't want to use Chrome, no worries...we also test the site in Internet Explorer 8, Internet Explorer 9, Firefox, and Safari. With security causing lots of problems for other companies lately, we decided to stop everything and work on security. We modified our login and registration to only work over a secure connection. This will automatically encrypt all of your passwords as you submit forms around the site. If you run into any issues with these new changes, please e-mail our support team at support@tomorrowspro.com. The Schedule/Results page for Leagues and Divisions give your players/parents/coaches the ability to see what is going on in the league. See the full boxscore results for games int he past and the schedule for games in the future. To save time, the date picker is already filtered to only show dates where games occur. 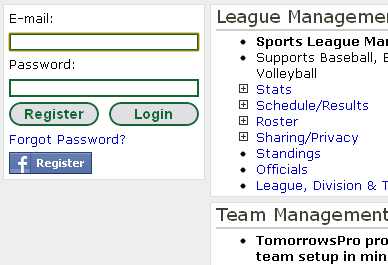 The Officials page is available for Leagues and Divisions. Each Official can be listed for public access if you would like to share that information. Access control for league and division officials pages are tied together so access will be granted to both if you want one visible.